The Saleae Logic 8 USB Logic Analyzer is an 8 channel logic analyzer with each input dual purposed for analog data recording. 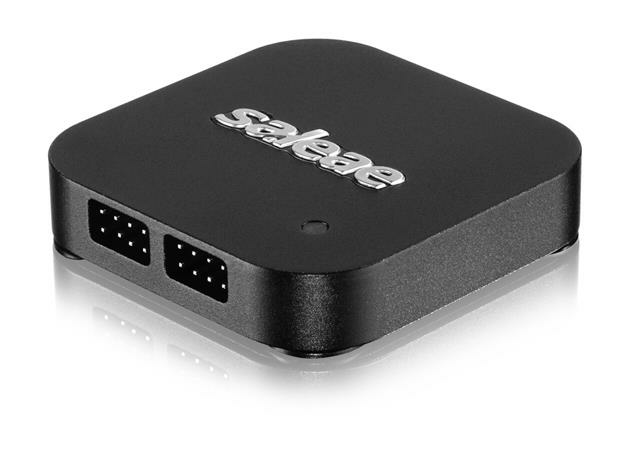 The device connects to a PC over USB and uses the Saleae Logic Software to record and view digital and analog signals. A logic analyzer is a debugging tool used to record and view digital signals. It operates by sampling a digital input connected to a device under test (DUT) at a high sample rate. These samples are recorded to a sample buffer, and at the end of the capture, the buffer is displayed in the software for review. Logic analyzers are great for debugging embedded applications. In the most common case, a developer working on firmware for a microcontroller will write code to communicate with another component, possibly using protocols like serial, I2C, or SPI. To verify the functionality or to diagnose errors in the firmware, a logic analyzer is connected to the digital IO used for communication and records the activity during testing. The recording is then shown on the display so the user can view the actual behavior of the firmware, and compare that with the expected behavior to narrow down and identity the source of the issue – or verify that the operation is correct. Thank you for looking, if you have any questions please ask or ring 01623 720730. Please see our other items for a wide range of Electronic components. © Copyright Basic Micro 2013 All rights reserved.